Welcome, and nice job! Maybe the light from the rear windows could be made more convincing if it didn’t reach all the way under the stair landing, and looked more as if it could have come through the rear windows? Here is another with a different lighting scheme. It’s getting close to what I want, but could use some crits. Matt - Great start! Looks like you’ve got some serious light leaks, see if you can figure out why light is leaking around the arches and under the stairs like that. Is it the shadow bias of dmap shadows? Or you just need some blocker geometry to help soft shadows start sooner? 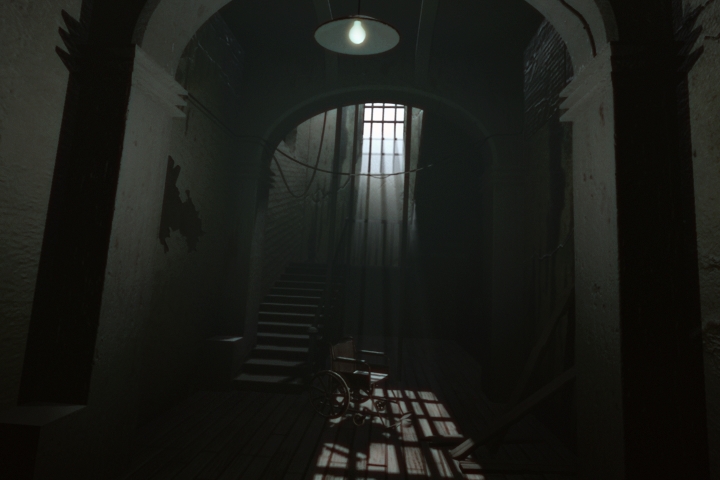 petacgtalk - There’s some random light in that scene that is missing its shadows or occlusion, and doesn’t really seem to be motivated. See if you can hide all your lights and test-render with just one light visible at a time until you can chase down what doesn’t belong. @matt grdinic: great work for for quick job man . By the way, i think there are some lights leaking through the corners of the arches, so maybe you can fix those up because the corner of arche should be much more darker due to low lighting scheme. But again it’s a good work keep it up man. @jeremy : wow jeremy i like the church look very much. can you explain the process on how you can make the volumetric lights color to match the stain glass color? I hope this doesn’t double post. Didn’t post first try. Here’s the updated version using render layers, comped in Shake. Not quite happy with it yet, but looking for some crits to see where to go from here. Maybe too dark still? frame13 - That’s a nice scene. I don’t think it’s “too dark” but it might benefit from more contrast. If you could choose a few areas, like parts near the light bulb, to make brighter, and let some other areas fade away so they moved into blackness, that could help make it more dramatic instead of having too much of the same level of dark gray. can you explain the process on how you can make the volumetric lights color to match the stain glass color? I actually had trouble with the parti_volume look, it seems to require that you use a light with the physical_light light shader, which doesn’t match the area lights I had been using for the other passes, so I ended up with volumetric lighting that was more hard-edged and didn’t exactly align with the colors I was projecting into the scene. @ petaCGTALK wonderful image. The yellow toning really make the image spot. Yes I was trying to get away from dark and forboding. I noticed the light leaking in and will check out where its coming from. It’s about 14MB, so it will take a bit to download. I’ll be posting a new version with better bump maps on the wood planks and some other fixes, but any suggestions are always welcome. The original post had a less accurate quicktime. This new link should be closer to the right gamma levels, etc. Thanks for the feedback! My light bleed was fixed by turning on Final Gather. I usually wait to go for the 1-2 GI and FG punch until last, as this render took over 45 minutes, compared to the 16 minutes for the non-fg one. Other than that, everything’s the same compared to the old one, except I fixed some UV mapping on the walls and floor. You know what would be sweet? If that light hanging from the ceiling was swaying gently back and fourth. You know, like something just busted out of their all quick like, which would be curious considering the wheel chair. When doing anmation, always ask yourself: What super cool and interesting thing am I showing the audience? Also, what kind of rendering capabilities do you have? Does your school have  a render farm? I cant image rendering out all of that on a single computer. Finally, I really like the graininess of the window fog, kind of gives it that film look. Was that something you set up in Shake, or was it a byproduct of fogs tendency to render somewhat grainy if not enough samples are provided? You know what would be sweet? If that light hanging from the ceiling was swaying gently back and fourth. That's actually something I'd considered a while back. It may actually give it the added something it needs. Does your school have  a render farm? I cant image rendering out all of that on a single computer. Yeah, I was looking at 15 hour renders using my 3 machines (5 total processors). But with the render farm (about 40 machines while school’s out), it’s going about 2 hours or so. If I had the full render farm of up to 400 and local access, I’d be seeing 20 minute renders or so. That’s mostly ‘out of the box’ but I am doing quite a bit of CC that I think is enhacing the graininess some. @jeremy : thanks alot jeremy for the related articles on how to do the volumetric lighting. I think i’m going to try it first. Your animation looks nice, it adds alot to the feeling of the space to be moving inside it. I think the only real area to fix up is the beginning (the area that appears in the foreground on the still image) with the lightbulb and lampshade and arches. The lampshade is exactly the same tone as the arches and the walls besides the arches, not giving me a feeling of the inverse square (quadratic) decay that we expect when up close to a bulb. Also, it looks very uniform as if it were all diffuse lighting, no reflection of the bulb onto the shade or highlights on the wall. (On the arches, the light even seems to continue up towards the top, above where it would be shadowed by the lampshade.) If that area got more contrast, with brighter hightlights and more dark tones and shadows, I’d think the whole scene could be more solid looking. This will be a nice little shot for your showreel, if that’s what you’re going for. In terms of animation, you might even think about whether the bulb flickers or something swings or wind blows or something, but that’s just a thought. 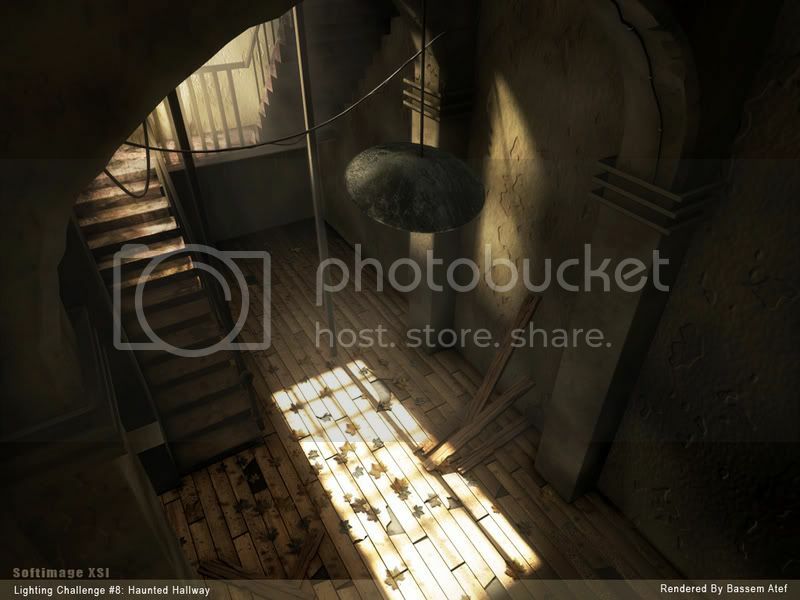 Jeremy Birns render with a strong greenish indirect light from upstair was just perfect, makes me wounder whats up there. BTW, would it be ok to change things like the wooden floor? djmj - Good start. Are some of the walls somehow not casting shadows? It looks as if that bright light coming from screen-right shines right through some of the walls. Feel free to change what you want. We aren’t going to start the next challenge until next week, so you have time to make a nice scene while everyone’s still looking. akwavox - In terms of color, maybe the red lampshade is too much of a center of attention in such a colorless scene, I’d play with either toning it down or putting warmer more saturated colors a few other places. Maybe there could be a bit more bounce light on the lower parts of the wall near the blown-out part of the floor, and on the slats of wood in the white window? On the other hand, i worked on another compo, by night this time. Playing with the “darck”, the fog… Hope it’s not too darck on PC. On more time, feel free to critics ! BsBs -> Really great work, i like it, especialy the mood and lights. You should just improve the wall and colomns shaders to be perfect i think. Anyway, i really like the feeling here, great work ! !